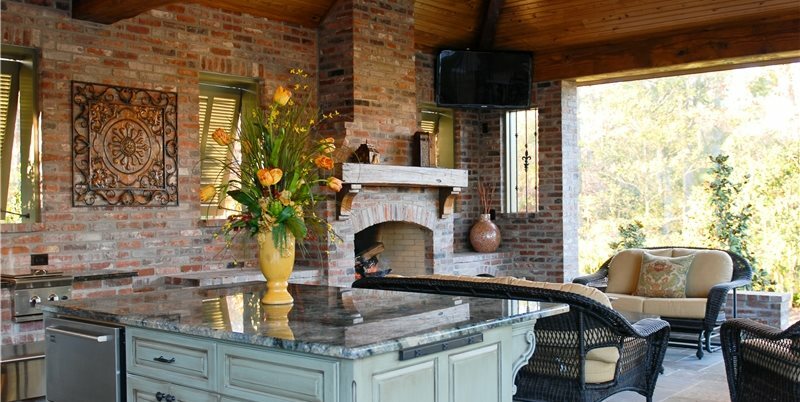 This outdoor kitchen was built to survive the high speed winds of a hurricane. By day and night, the covered kitchen is an entertainer's dream. The island features faux finished Spanish cedar cabinets and granite counters. 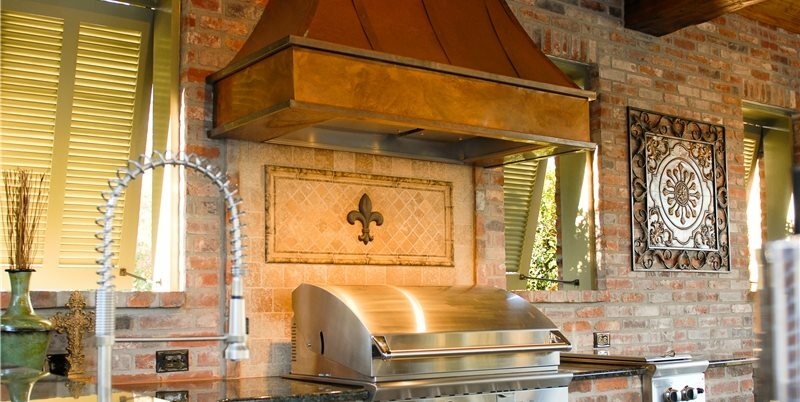 A custom copper hood provides ventilation for the grill area. 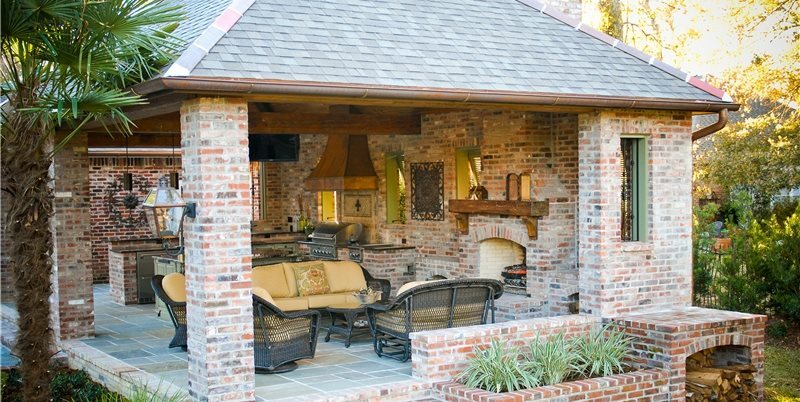 The wood-burning fireplace creates an outdoor living room feel. 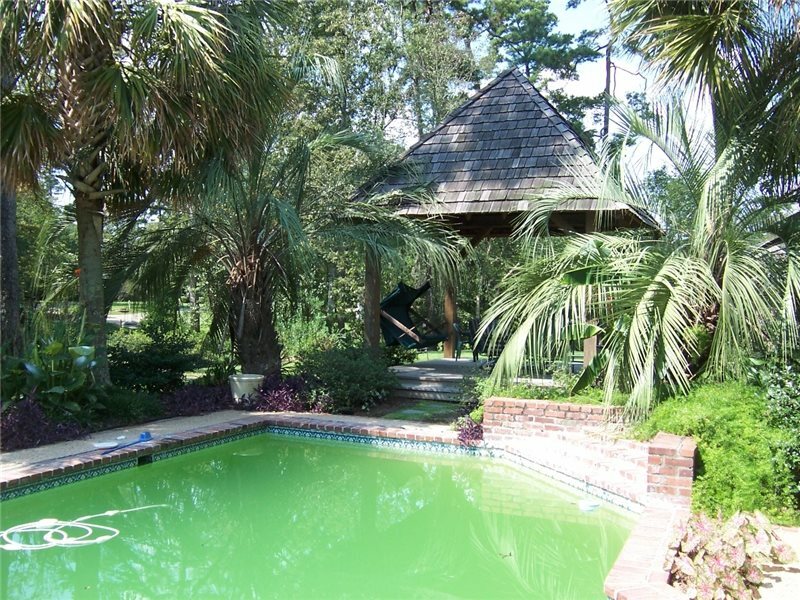 A before photo of the green pool and overgrown landscape. 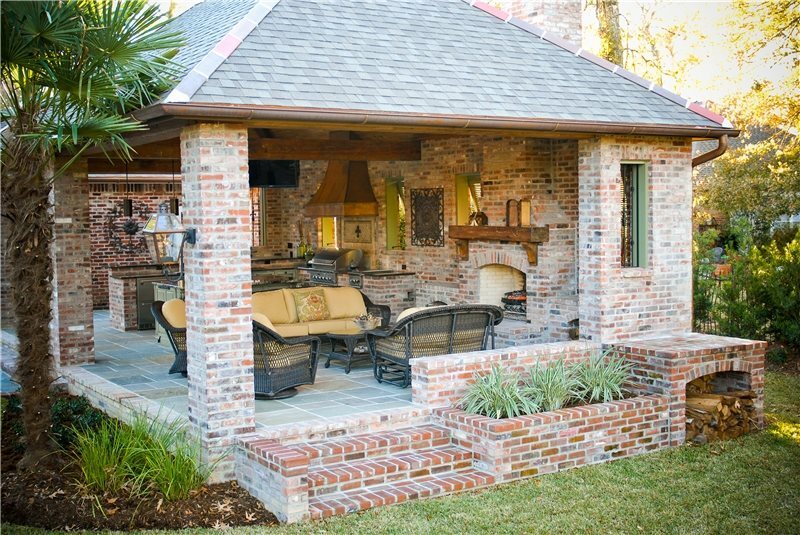 "This home's backyard wasn't being used to its fullest potential," says Jared Jones, a landscape architect at Angelo's Lawn-Scape of Louisiana. 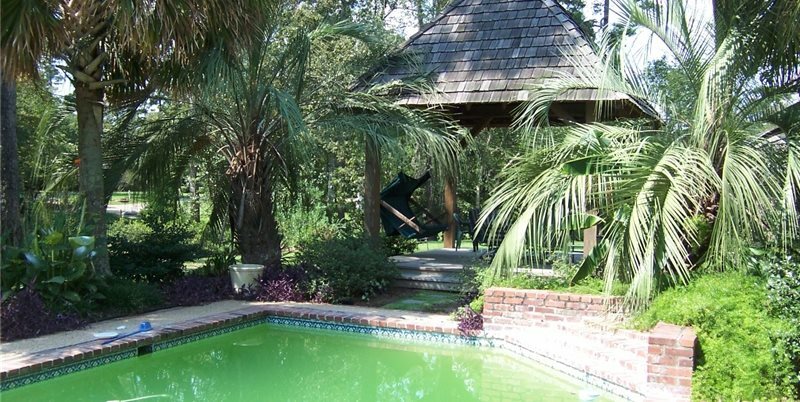 The yard had an existing pool with green water and many overgrown plants. 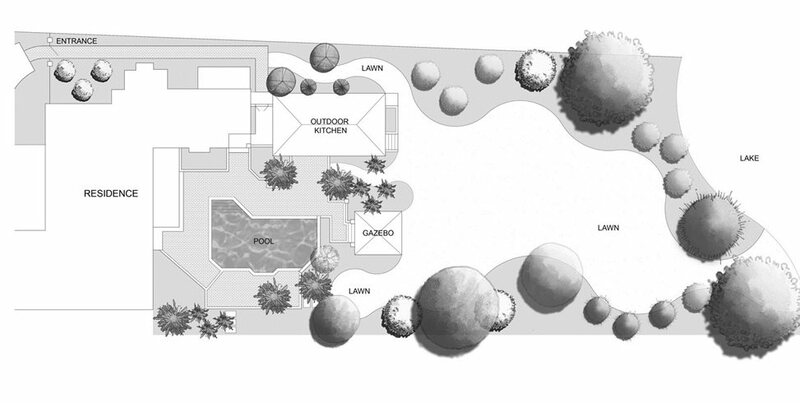 At first the company was hired only to do a pool renovation, but as the homeowner's began to realize the potential of their yard as an outdoor entertaining space, the plans expanded. "The original landscape was installed over 15 years ago, the plants had suffered through hurricanes Gustav and Katrina," Jones explains. Crews from Angelo's were brought in to clear out the property and salvage what they could. Sadly some mature oak and pine trees were lost due to damage. 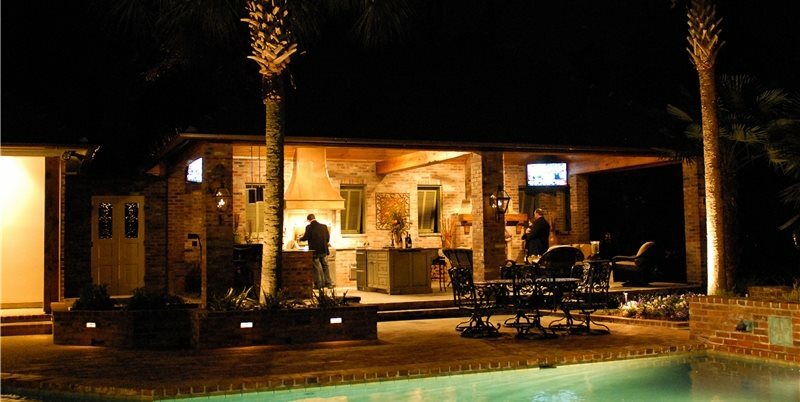 After seeing the re-plastered pool, complete with a brick water feature wall, the homeowners began to think of their backyard as a place to entertain large groups of people. 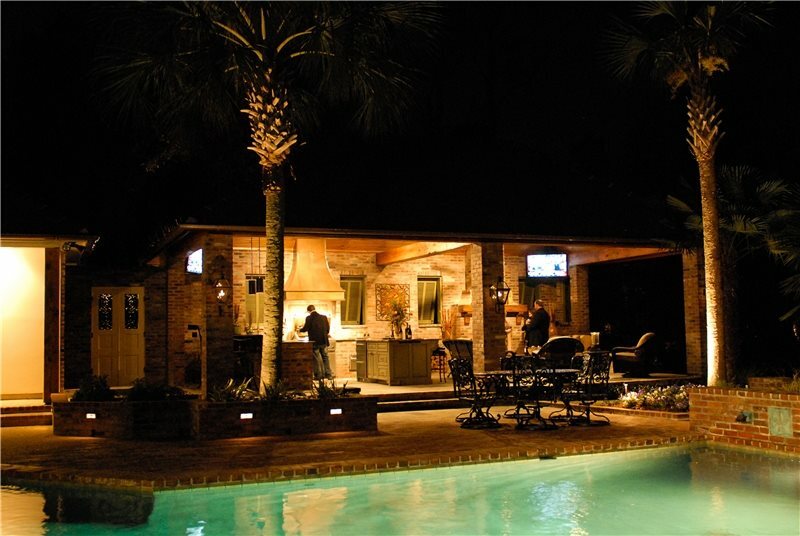 They let Jones know that they wanted an outdoor kitchen and a fireplace built next to the pool. The biggest challenge on this project was the time schedule. "Because of the deadline, we ran utilities and poured concrete before the homeowners had picked out all the appliances," explains Jones. He warns that this is an untraditional approach that took some creativity and flexible planning. "We came up with a general kitchen layout that we used for the initial phase of construction. Because of our forethought, the appliances selected by the client all had access to the appropriate utilities," he explains. Jones only recommends this approach if absolutely necessary, it is much better to know exactly which appliances you are using before beginning construction. According to Louisiana building codes, all structures must be built to withstand winds up to 150 miles per hour. Since the structure Jones designed has a solid wall and roof, it was treated just the same as a house. "We had to pull all the same permits and go through all the same inspections that a homebuilder does," states Jones. The structure has a full foundation with 3' deep footings. 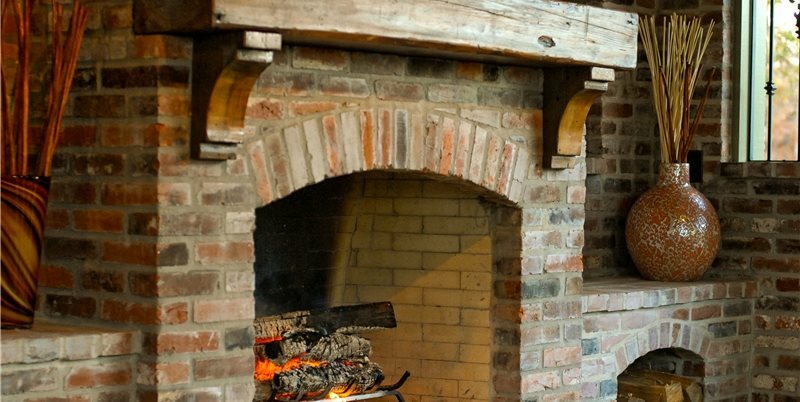 The walls are wood-framed and wrapped on both sides with brick. Use HardiePlank® for the exterior of your structure instead of brick, this will lower your costs considerably. HardiePlank® is fiber cement siding that mimics wood and is warp and termite resistant. The style of this project was derived from the home's architecture. 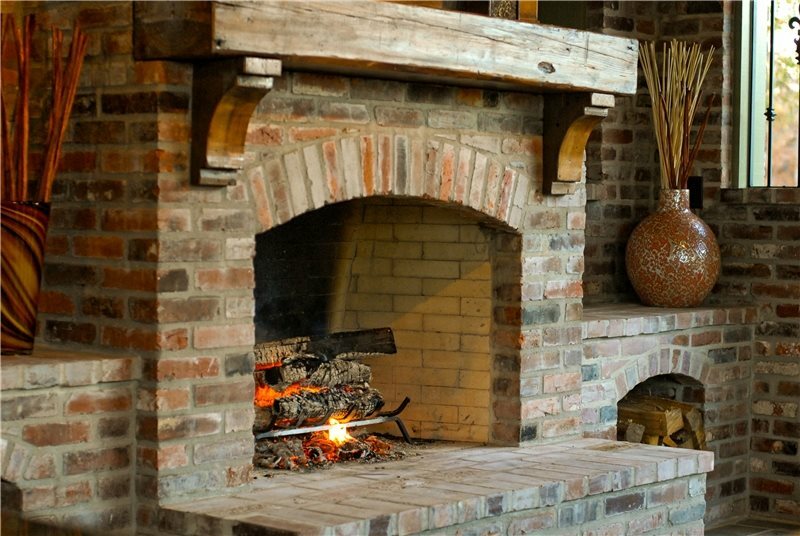 "We used a combination of brick, stone, metal and wood to create a warmth and quality in keeping with the high-end home," explains Jones. 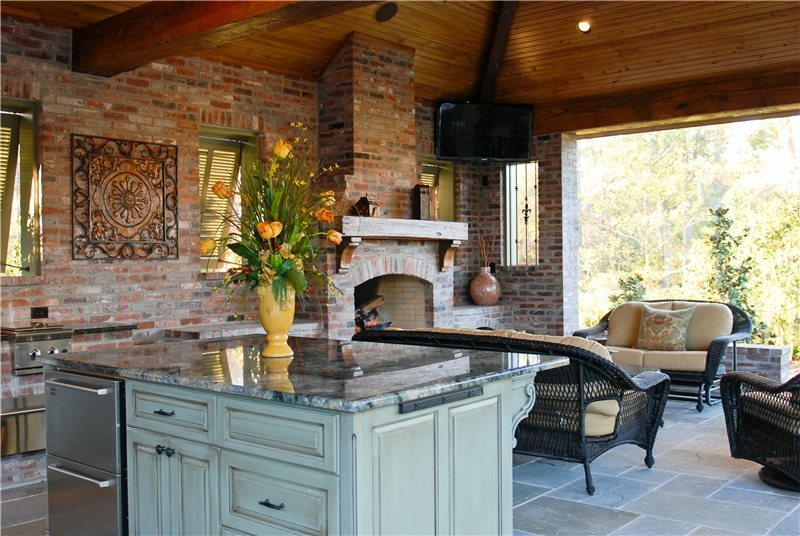 One of the most unique features of the outdoor kitchen is the large island. "The cabinets are made of Spanish Cedar, which is rot-resistant outdoors. The solid roof allowed us to paint them with a faux finish that would not have been feasible otherwise," he says. UPPER STORY IMPACT Arbutus ‘Marina’—a hybrid form of madrone, the California native. Ficus carica ‘Black Mission’—fig. ‘Majestic Beauty’ and ‘Mission’ olives—the blue-gray foliage is typical of the Mediterranean look. SPIKY INCIDENTS Anigozanthos ‘Harmony’—kangaroo paw for quirky, velvety flowers. Astelia nervosa—silver spear. Phormium ‘Dusky Chief’ and ‘Sea Jade’—these bronze New Zealand flax make strong focal points. Thamnochortus insignis—vertical architectural clumps of reed-like leaves up to 4 feet high. 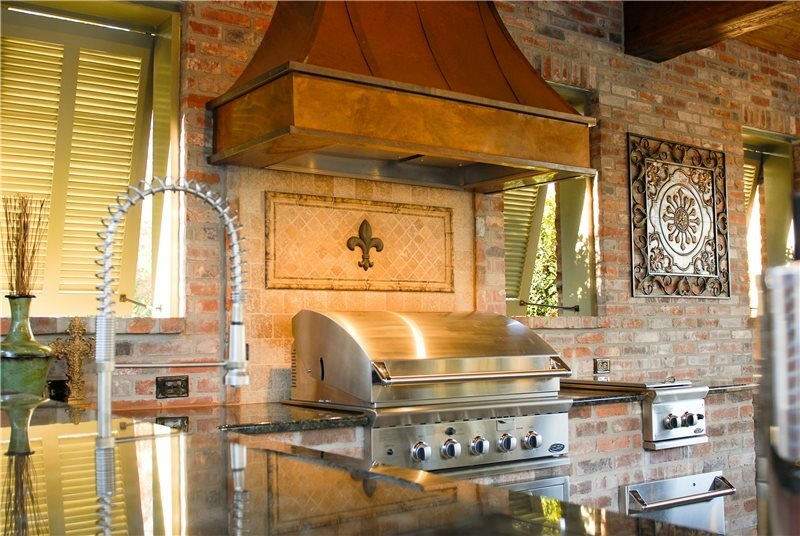 Another striking element is the large copper hood that hangs over the grill. Over the years the copper will develop a beautiful patina, but Jones believes that it will never turn completely green because it is not directly exposed to the elements. "Proper ventilation was incredibly important since the structure had a solid roof and walls," he explains. Jones prefers using commercial grade hood vents to remove smoke from the grilling area. As a concluding note, Jones says "This backyard kitchen is an entertainer's dream - you can have the football game on in the kitchen or listen to John Mayer by the pool." From top-of-the-line stainless steel appliances, to a high-tech audio/visual system, this space has it all.